If you like having a clock around that you know you can rely on, this one will stay powered even after the power has been out for a month. 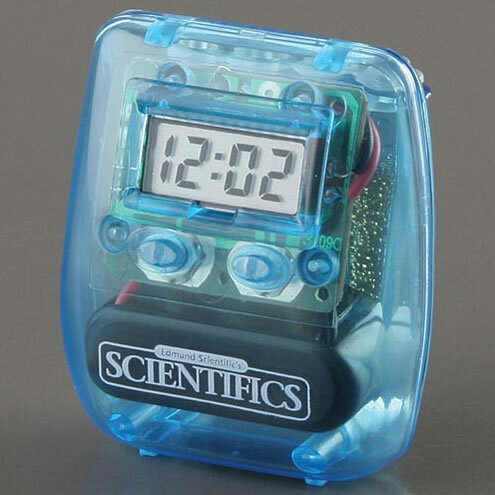 The clock has no fancy extras, it doesn’t do any interesting tricks, it doesn’t even double as an alarm clock. It just displays the time, which isn’t that exciting, but the way that it keeps powered is the interesting part. We’ve shown eco-friendly clocks before, a couple that have been powered by water. This one can be powered by water, but it has other ways to be powered as well. To power up this clock you can use absolutely any liquid, beer, milk or even pink lemonade. Whatever your heart desires, it’ll work, although personally I think going with milk might not be the greatest idea. Since it is powered by liquids you’ll never need a single battery, which is always nice on the budget and a bit more earth friendly. The clock isn’t very big, it’d be great for a study corner. It’s only 1” by 2” and of course includes directions so that you know how to work the clock. You can pick it up for $7.95. This is NOT powered by the liquid. This one’s battery is two strips of different metals, separated by the liquid which acts as an electrolyte. Just the same way an ordinary cell battery works. After a few weeks, the metal strips will be exhausted and this thing will be completely bloody useless, no matter what water you put in. Save your money, save some resources, don’t this junk.